Laura makes custom crocheted Pillows. They are approximately 15 inches tall and awesome. Ella’s head would explode if she had a red E. Just yesterday, she peeked her head out of her room (at bedtime) and said: “Mom, I need an E!” She ran into the living room and looked for an E in a puzzle we have. Don’t you sometimes feel like you need an “E” or maybe an “M”? Right now I’d quite like an H, a U, and a G. All in pink, definitely. 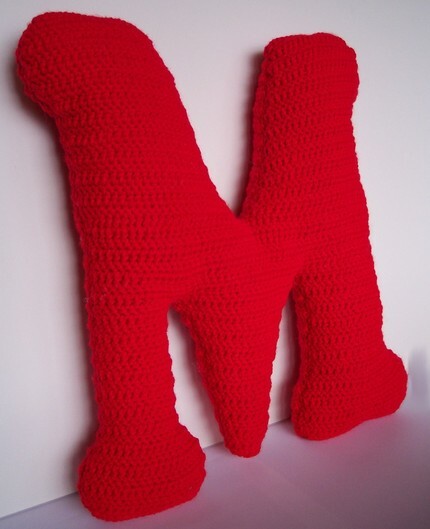 A great present for my sister’s birthday as her name is Marié and she loves red! Thanks for the idea. Thanks so much for sharing my letter pillows. I have lots of fun making them. I hope to make every letter in the alphabet.